Deliver the message that will decide Whiterun's allegiance. Whiterun prepares for some excitement! Deliver a message to the Jarl of Whiterun. Wait for the Jarl's response. Deliver Balgruuf's axe to Jarl Ulfric. Return to Whiterun and warn Jarl Balgruuf. Report to Legate Quentin Cipius. General Tullius will hand you a note, explaining that he needs someone he can trust to deliver it and sets you the task to deliver it to the Jarl of Whiterun. Travel to Whiterun and then to Dragonsreach, and speak to the Jarl. Give the message to the Jarl, and he will decide it is time to confront Ulfric. He will then give you a message (an axe) to deliver to Ulfric. Now, travel to the city of Windhelm, and then to the Palace of the Kings. Ulfric tells you to return the axe back to where it came from and to expect a lot of excitement for Whiterun. Return back and talk to the Jarl, who will take back the axe and hand you back to the Legion. Speak to Legate Quentin Cipius, and he will tell you that the Stormcloaks have arrived and it is battle time. Balgruuf will not agree to read the message before Dragon Rising has been completed. If you are on The World-Eater's Eyrie quest and Odahviing is still in Dragonsreach, you will not be able to deliver the message to Jarl Balgruuf. If you have a bounty in Whiterun, Legate Cipius will attempt to arrest you when you report to him. It would be a good idea to clear your bounty before reporting to Legate Cipius. Progressing through Season Unending while Message to Whiterun is active is not possible, see page for Season Unending for more details and workarounds. On your return to Dragonsreach with the axe, NPCs other than the Jarl may start dialogues with you and ask for your immediate assistance in fending off the Stormcloak attack. If you do so without speaking to Balgruuf, the journal entry "Return to Whiterun and warn the Jarl" may never disappear. You can fix this with the console command player.setobjectivecompleted cwpostwhiterunobj 1 1. When Jarl Balgruuf and Proventus discuss Tullius's message, they may stop talking, leaving you unable to continue. Loading a previous save should fix this. This quest may fail to even start after giving Tullius the Crown and receiving the appropriate dialogue. You can fix this with the console command setstage cw03 10. However, sometimes this may fill the console with values instead of starting the quest, in which case you can restart your game and re-enter this console command and the quest will begin. 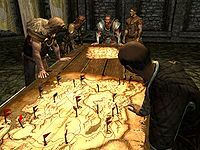 Only stages and objectives relevant to the Imperial version of this quest are included in the table. 10 I am to deliver a message to the Jarl of Whiterun. It is time for him to pick a side in the war. 50 The Jarl of Whiterun has sided with the Empire. I am to inform Jarl Ulfric Stormcloak of this decision. 100 Ulfric plans to make war on Whiterun. I should return and warn the Jarl. The following empty quest stages were omitted from the table: 1, 2, 15, 30, 40, 199, 200, 230. On the PC, it is possible to use the console to advance through the quest by entering setstage CW03 stage, where stage is the number of the stage you wish to complete. It is not possible to un-complete (i.e. go back) quest stages, but it is possible to clear all stages of the quest using resetquest CW03. This page was last modified on 28 January 2018, at 16:05.